Letting your chosen guests know of your impending big day is one of the most important and exciting parts of the wedding plans. Make your selection carefully. The card you choose sets the tone for the entire day and will relay to the receiver the type of wedding they have been invited to attend. Here are some quick tips that will ensure you get it right first time. An emerging trend in wedding planning is to send not one but effectively two invitations to the guests. The first is the Save the Date card. This is a great way of announcing the forthcoming day and ensuring that your chosen guests keep the day free.Save the date cards are normally only a single piece of card, often in the shape of a luggage tag, and are sent around three to six months before the big day itself. It is not uncommon for the happy couple to send them out as soon as they have decided upon the day of the wedding – and that can be up to 18 months away! They are sent either by the couple or by the parents of the couple. Who dispatches them really depends on the degree of formality of the wedding itself. Don’t stress too much about this with save the date – just make sure that only those people you want to invite receive them. You don’t want to send it to individuals who don’t make the final guest list. This would be an embarrassing and potentially awkward error! Weddings invitations are often a huge expense. Before you commission a top stationer to make up yours, think - could you do it yourself? If you or your partner is especially creative and artistic you may well have the skills. If you are going to go down the DIY route, you need to execute it perfectly. Practice, practice and more practice will ensure that your guests receive a wonderful invitation and that you are complimented on your amazing artistic abilities! Choose colours and plan your design. Think about what you are going to use; are you going to trim the card with beading? Does your wedding have a theme that you would like to portray in the invitation? Give yourself plenty of time and do thorough research; what do the experts do when they make invitations? The address that the guest needs to RSVP and a time by which they need to do so. Some optional pieces of invitation might be whether or not children are invited and the time that the wedding will end. Invitations should be sent by the host of the wedding. Traditionally they come from the bride’s parents. It is also possible these days for both sets of parents to invite the guests to the wedding. Obviously, if either set of parents is divorced then the wording becomes slightly more complicated. In such cases the happy couple may prefer to invite guests on their behalf. This is perfectly socially acceptable so don’t worry about going against convention. Give your guests about eight to ten weeks notice. If some of them are going to be traveling from abroad you may like to let them know well in advance of that and it would be common courtesy to do so. 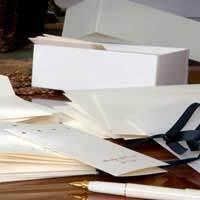 As well as sending an invitation don’t forget other essential pieces of invitation. A map to the church and/or reception venue as well as details of local hotels that the guests may wish to book into for the night will prove very useful. A request for any dietary details of the guests may also be appropriate – ask them to include such information on the RSVP. Once you have sent out your invitations wait for the RSVP’s to come rolling back in. It’s time now to really prepare for the big day. Good luck and have a wonderful day!